Maho Minami (Shiori Kutsuna) returns to Japan after studying in New York. Her half brother Ryusuke Minami (Hiro Mizushima) is an ultra talented guitarist. Maho & Ryosuke then meet Koyuki (Takeru Sato ), a fellow young teen whom Maho takes interest in. Soon enough, Ryosuke and Koyuki form a 5 piece rock band named “Beck,” while Maho and Koyuki become involved in a romantic relationship. The band starts to play live shows and grow an enthusiastic following. The release of their debut CD helps to further the band’s popularity. People start to notice Koyuki. The band then endures a producer’s planned conspiracy and other hardships. 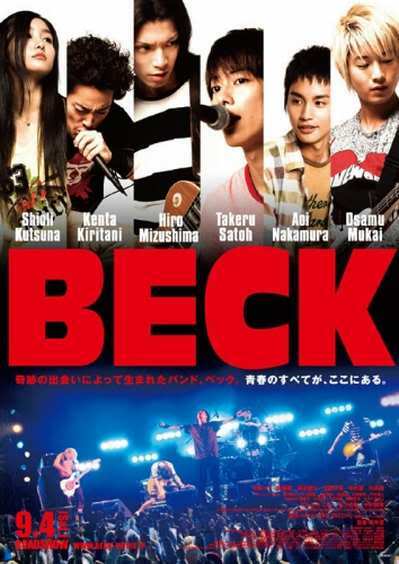 Beck then receives an offer to play at a rock festival, but with the unusual stipulation that the band may have to dissolve.